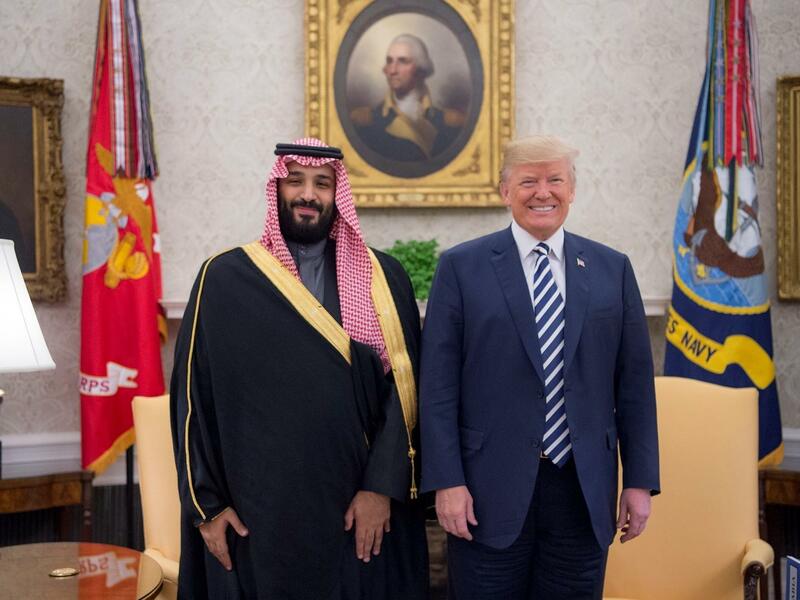 President Trump poses for a photo with Crown Prince Mohammed bin Salman in March 2018. President Trump can be stinging and sarcastic. It's part of his charm, for those who find it charming. He has the audacity of discourtesy, if you please, whether calling a woman "Horseface," as he did this week, or ridiculing African nations as ... something I quoted on the air only once. But the president reveals a softer side when he talks about strongmen and dictators. He's said there may be "severe" consequences if Saudi leaders ordered the killing of Jamal Khashoggi. But when the president received Crown Prince Mohammed bin Salman at the White House last March, he told reporters, "We understand each other. Saudi Arabia is a very wealthy nation, and they're going to give the United States some of that wealth, hopefully." The president has often been magniloquent in his praise of those who control the press, suppress dissent, and strike down dissidents. He praised Vladimir Putin, saying before the 2016 election, "The man has very strong control over a country. Now, it's a very different system, and I don't happen to like the system. But certainly, in that system, he's been a leader, far more than our president." When Bill O'Reilly, then of Fox News, called Putin "a killer," Trump memorably replied, "There are a lot of killers. You think our country's so innocent?" The president lauded President Rodrigo Duterte of the Philippines, while human rights groups say his police and vigilante groups killed more than 7,000 drug dealers and drug users, without arrest or trial. "Many countries have the problem, we have a problem," Trump told him, "but what a great job you are doing and I just wanted to call and tell you that." President Trump celebrated with President Xi of China when his parliament prepared to approve a change to allow President Xi to stay in office indefinitely. "I think it's great," Trump told him at his Mar-a-Lago estate. "Maybe we'll give that a shot some day." And of course the president has gotten almost dewy-eyed over Kim Jong Un of North Korea, telling Fox News, "He's got a very good personality, he's funny, and he's very, very smart." Later he told a rally in West Virginia, "He wrote me beautiful letters. And they're great letters. We fell in love." Flattery is free, and presidents have sometimes had to praise despots — Stalin during World War II, or Mao Zedong when the door to China was thrown open — for larger national interests. President Trump often scores political points with sarcasm. But when the president pours praise on so many despots, he sounds nothing but sincere. President Trump can be stinging and sarcastic. It's part of his charm, for those who find it charming. He has the audacity of discourtesy, if you please, whether calling a woman Horseface, as he did this week, or ridiculing African nations as something I quoted on the air only once. But the president reveals a softer side when he talks about dictators. He said there may be severe consequences if Saudi leaders ordered the killing of Jamal Khashoggi. But when the president received Crown Prince Mohammed bin Salman at the White House last March, he told reporters, we understand each other. Saudi Arabia's a very wealthy nation, and they're going to give the United States some of that wealth, hopefully. The president has often been magniloquent in his praise of those who control the press, suppress dissent and strike down dissidents. He praised Vladimir Putin, saying before the 2016 election, the man has very strong control over a country. Now, it's a very different system, and I don't happen to like the system. But certainly, in that system, he's been a leader, far more than our president. Bill O'Reilly, then at Fox News, called Putin a killer. Trump memorably replied, there are a lot of killers. You think our country is so innocent? The president lauded President Rodrigo Duterte of the Philippines while human rights groups say his policies and vigilante groups killed more than 7,000 drug dealers and drug users without arrest or trial. Many countries have the problem. We have a problem, Trump told him. But what a great job you were doing, and I just wanted to call and tell you that. President Trump celebrated with President Xi of China when his parliament prepared to approve a change to allow President Xi to stay in office indefinitely. I think it's great, Trump told him at his Mar-a-Lago estate. Maybe we'll give that a shot someday. And, of course, the president has gotten almost dewy-eyed over Kim Jong Un of North Korea, telling Fox News, he's got a very good personality, he's funny and he's very, very smart. And later told a rally in West Virginia, he wrote me beautiful letters, and they're great letters. We fell in love. Flattery is free, and presidents have sometimes had to praise despots - Stalin during World War II or Mao Zedong when the door to China was thrown open - for larger national interests. President Trump often scores political points with sarcasm. When the president pours praise on so many despots, he sounds nothing but sincere. JOHN ALCORN: (Singing) Someday he'll come along, the man I love. And he'll be big and strong, the man I love. And when he comes my way, I'll do my best. Transcript provided by NPR, Copyright NPR.